Former member of MECha, which seeks to facilitate Mexico’s reconquest of the Southwestern U.S.
Born in Tucson in February 1948, Raul Grijalva attended the University of Arizona where he joined the campus chapter of the radical Chicano organization MEChA. His young adulthood coincided with the peak of “El Movimiento,” the Chicano civil-rights movement that imbued him with what he later described as “anger” over how his public-school education had “made [me] feel I wanted to be an Anglo.” Grijalva also became a leader of the Raza Unida Party in Arizona. In 1970 Grijalva helped lead a confrontational campaign that successfully intimidated Tucson’s City Council into authorizing the construction of a “people’s park” and community center on a plot of land that was part of a public golf course in a mostly Mexican-American neighborhood. After losing his 1972 bid for a seat on the Tucson Unified School Board, Grijalva studied the activism of Saul Alinsky and came to understand that his own unfiltered militancy was likely alienating some members of his local community. Thus he began to cultivate a more mainstream approach that included outreach to non-Hispanics, and in 1974 he was elected to the school board where he would serve for the next 12 years. In 1987 Grijalva was named Assistant Dean for Hispanic Affairs at the University of Arizona, a post he continues to hold. And from 1989-2002 he was a member of the Pima County Board of Supervisors. Bolstered by support from organized labor and the Sierra Club, Grijalva in 2002 was elected, as a Democrat, to Arizona’s newly formed, carefully gerrymandered Seventh Congressional District, whose population was more than half Hispanic and two-thirds Democrat. He has been re-elected to Congress every two years since then, though after the 2010 census his District was renumbered as the Third and became even more heavily Democratic than its predecessor. The Communist Party USA newspaper, Peoples World, supported Grijalva’s 2002 campaign and praised his “uncompromising support for working people, for better schools, against racism and as a lifelong environmentalist.” The activist group 21st Century Democrats also strongly endorsed Grijalva’s candidacy. 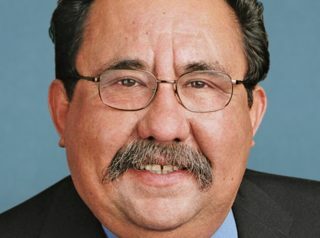 Soon after his election to the House of Representatives, Grijalva became a member—and later a co-chairman—of the Congressional Progressive Caucus. In one of his first speeches as a House member, he called for the creation of a national holiday to honor Cesar Chavez, founder of the United Farm Workers of America. In December 2004 Grijalva joined fellow lawmakers Barbara Boxer, Dennis Kucinich, and Henry Waxman in providing diplomatic courtesy letters to a contingent of anti-Iraq War activists (including Medea Benjamin and Jodie Evans) who sought to bring $600,000 in cash and humanitarian aid to residents of Fallujah, Iraq, which at that time was a hotbed of terrorism and violence. The trip was sponsored by such groups as Code Pink, Global Exchange, the Middle East Children’s Alliance, Peace Action, Physicians for Social Responsibility, United for Peace and Justice, and Voices in the Wilderness. In 2005 Grijalva became a member of the Out-of-Iraq Congressional Caucus. That same year, he joined Xavier Becerra and Luis Gutierrez in backing the efforts of Latinos for Peace, an anti-Iraq War front group for the Communist Party USA. In August 2008 he was named to the Barack Obama presidential campaign’s National Latino Advisory Council, along with such notables as labor leader Eliseo Medina and U.S. Representatives Xavier Becerra, Luis Gutierrez, Linda Sanchez, Hilda Solis, and Nydia Velazquez. Throughout his years in Congress, Grijalva has been best known for his positions on immigration. Describing America’s existing immigration laws as “cruel” and “unjust,” he seeks not only to increase future legal entry into the United States, but also to help pass “comprehensive” reform that would legalize the status of those already residing in the country unlawfully. Moreover, Grijalva is a longtime advocate of the DREAM Act, legislation that would enable illegals who first came to the U.S. as minors to access federal and state financial aid for their post-secondary education; to attend college at the reduced tuition rates normally reserved for in-state legal residents; and to earn conditional permanent residency and a path to citizenship. In 2007 Grijalva told a group of immigration-reform advocates: “In a perfect, perfect world we’d have an open border, but … with immigration we have to deal with reality”—meaning that in the pursuit of sweeping reforms, some concessions and compromises would be unavoidable. In 2010 Grijalva vehemently opposed SB-1070, a newly enacted Arizona law authorizing state police to check the immigration status of criminals suspected of being in the U.S. illegally. He called for the law’s “repeal” as a way to “strike a blow against racism and [to] change Arizona’s legislature.” He also advocated “a targeted ban on conventions and conferences in the state for a limited time.” When a newsman asked Grijalva if he was in favor of sealing the U.S.-Mexican border against the inflow of illegal drugs, the congressman angrily walked away while calling the reporter “punkish” for having asked the question. On October 8, 2013, Grijalva was one of eight House Democrats arrested for intentionally blocking rush-hour traffic in Washington DC during an immigration rally aimed at persuading Congress to pass legislation allowing illegal immigrants to apply for U.S. citizenship. Also arrested were Representatives Joseph Crowley, Keith Ellison, Al Green, Luis Gutierrez, John Lewis, Charles Rangel, and Jan Schakowsky. On January 27, 2010, Grijalva was one of 54 members of Congress who signed a letter calling on President Barack Obama to use diplomatic pressure to end Israel’s blockade of Gaza—a blockade which had been imposed in order to prevent the importation of weaponry from Iran and Syria. At a December 13, 2011 news conference in DC, Grijalva and Rep. Keith Ellison introduced their Restore the American Dream for the 99 Percent Act.pdf), which proposed to use many billions of taxpayer dollars to create “over 5 million” government-funded jobs and training programs in such realms as infrastructure, transportation, conservation, and early childhood development. Grijalva was one of dozens of Congressional Democrats who elected to boycott the January 20, 2017 inauguration of President-elect Donald Trump. To view a complete list of those who chose to boycott the event, click here. According to a GovTrack.us analysis, Grijalva is the most ideologically far-left member of the House of Representatives. For an overview of Grijalva’s voting record on key issues during his years in Congress, click here. At one time, Grijalva was a board member with the Center for Progressive Leadership. For additional information on Raul Grijalva, click here.